The Queen's Crown of Norway. DigitaltMuseum.no Project. The crown of the Queen of Norway was made in 1830 for Désirée Clary's coronation. It did not take place, and was first used in 1860, for the coronation of Louise of the Netherlands. It was made in Stockholm and, though it is unknown by whom, probably by Marc Giron, the royal jeweller, some have speculated it may have been by Erik Lundberg, or, perhaps is a combination of both's work, and the design is probably based on the crown of Louisa Ulrika of Prussia. It made of silver-gilt and gold, and is decorated with a number of multicoloured gems and pearls, including violet (Amethysts), yellow (Citrine and Topaz) and green (chrysoprase). It weighs approx 530g. 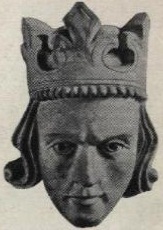 Eric Magnusson was the King of Norway from 1280 until 1299. St Edward's Crown is the centrepiece of the Crown Jewels of the United Kingdom. Named after Saint Edward the Confessor, it has been traditionally used to crown English and British monarchs at their coronations since the 13th century. The Holy Crown of Hungary, also known as the Crown of Saint Stephen, was the coronation crown used by the Kingdom of Hungary for most of its existence; kings have been crowned with it since the twelfth century. The Crown was bound to the Lands of the Hungarian Crown. No king of Hungary was regarded as having been truly legitimate without being crowned with it. In the history of Hungary, more than fifty kings were crowned with it, up to the last, Charles IV, in 1916. The Imperial Crown of the Holy Roman Empire was the hoop crown of the Holy Roman Emperor from the 11th century to the dissolution of the Holy Roman Empire in 1806. The crown was used in the coronation of the King of the Romans, the title assumed by the Emperor-elect immediately after his election. It was made in the late 10th or early 11th century. Unlike many other crowns, it has an octagonal rather than a circular shape, and is constructed from eight hinged plates. The plate in the front of the crown is surmounted by a cross, with a single arch linking it to a plate at the rear of the crown. The crown is kept in the Imperial Treasury at the Hofburg in Vienna, Austria. 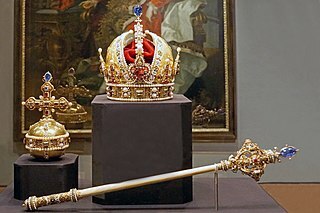 Danish Crown Regalia are the symbols of the Danish monarchy. They consist of three crowns, a Sceptre, Globus cruciger, the Sword of state and an Ampulla . The Danish Royal Regalia are kept in the treasury at Rosenborg Castle. The oldest of these is Christian III's sword of state from 1551. They further include King Christian IV's diamond; pearl- and gold-embroidered saddles; objects carved from ivory and rock-crystal; lapidary pieces of precious stones, and brooches in the form of fantastic animals. The regalia of Norway are items that symbolise the Norwegian monarch's power and majesty. Little is known of the old Norwegian regalia which have since been lost and the majority of items date from 1818 and were made for the coronation of Jean Bernadotte as King Carl III Johan. The Imperial Crown of Austria was made in 1602 in Prague by Jan Vermeyen as the personal crown of Holy Roman Emperor Rudolf II, and therefore is also known as the Crown of Emperor Rudolf II. The crown was used as a private crown of the Holy Roman Emperors and Kings of Hungary and Bohemia from the House of Habsburg. In 1804 it became the official crown of the newly constituted Austrian Empire. After 1867 it remained the imperial crown of the Cisleithanian part of the Austro-Hungarian Empire until 1918. The Bohemian Crown Jewels, sometimes called the Czech Crown Jewels, include the Crown of Saint Wenceslas, the royal orb and sceptre, the coronation vestments of the Kings of Bohemia, the gold reliquary cross, and St. Wenceslas' sword. They were originally held in Prague and Karlštejn Castle, designed in the 14th century by Matthias of Arras. Since 1791 they have been stored in St. Vitus Cathedral at Prague Castle. Reproductions of the jewels are permanently exhibited in the historical exposition at the former royal palace in the castle. The crown was made for the coronation of Charles IV in 1347, making it the fourth oldest in Europe. The Crown of Norway is the crown of the King of Norway and was made in Stockholm in 1818 by goldsmith Olof Wihlborg. The crown is a corona clausa consisting of a ring carrying eight hoops made of gold and surmounted by a globe of blue enamel and an amethyst cross on top of it. The crown is decorated with many pearls and gemstones including amethysts, chrysoprases, a topaz and an alexandrite. Its front is adorned with a huge green tourmaline, a gift of the Brazilian consul in Stockholm to King Charles III Johan. Its splendid colours and its richly elaborated ornaments make the crown typical of the Empire period. 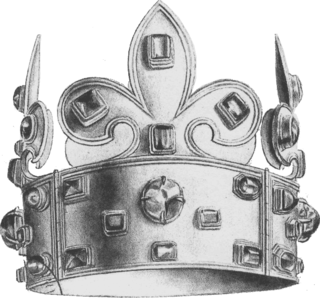 Although the goldsmith work was carried out by Olof Wihlborg, it is not known who designed the crown. Sweden's Royal Regalia are kept deep in the vaults of the Royal Treasury, underneath the Royal Palace in Stockholm, in a museum that is open to the public. The crowns and coronets have not been worn by Swedish royalty since 1907, but they are still displayed at weddings, christenings and funerals. Coronations in Norway were held from 1164 to 1906, mostly in the Nidaros Cathedral in Trondheim. Although a crowning ceremony was formerly mandated by the nation's constitution, this requirement was eliminated in 1908. However, Norwegian kings have since chosen voluntarily to take part in a ritual of "benediction" to mark their accession to the throne, during which the crown is present, but not physically bestowed upon the sovereign. The new ceremony retains some of the religious elements of earlier rites, while eliminating other features now considered to be "undemocratic". The coronet of Crown prince is one of the Norwegian Royal Regalia. Coronations in Europe were previously held in the monarchies of Europe. The United Kingdom is the only monarchy in Europe that still practices coronation. Current European monarchies have either replaced coronations with simpler ceremonies to mark an accession or have never practiced coronations. Most monarchies today only require a simple oath to be taken in the presence of the country's legislature. The Essen Crown is an Ottonian golden crown in the Essen Cathedral Treasury. It was formerly claimed that it might have been the crown with which the three-year-old Otto III was crowned King of the Romans in 983, which is the source of its common name, the Childhood Crown of Otto III. However, this idea most probably derives from the wishful thinking of early twentieth century historians of Essen and it is now widely rejected. However it is certainly the oldest surviving lily crown in the world.